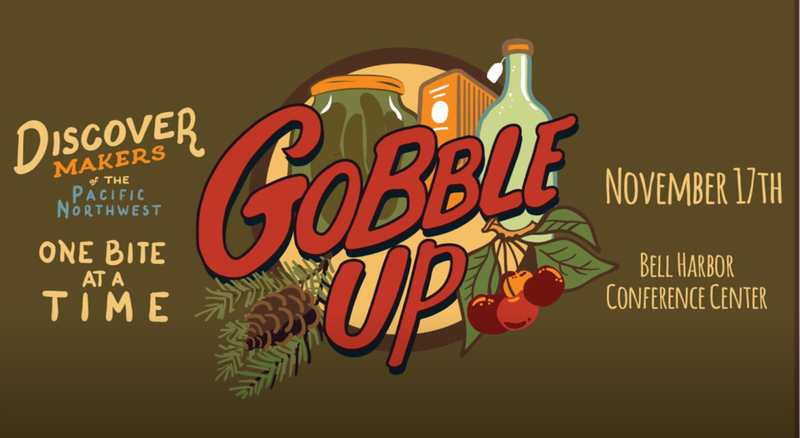 I’m pleased to participate in Gobble Up this year in Seattle. A show devoted to locally made artisanal food and handmade products for your table. Please do stop by! It’ll be a fantastic place to pick up unique treats for Thanksgiving, a superb host gift, or holiday gift shopping checked off the list early. My Mom! She’s an amazing cook who loves trying out new recipes and experimenting in the kitchen. We had a large garden growing up and canning was always a big summer activity when I was a kid. Though I didn’t inherit the green thumb, it planted a strong appreciation for the farm to table movement I enjoy now. Mom cooking up Christmas feasts for our big family over the years. Our tradition is a family recipe for chicken paprikash and spaetzle for dinner and my mom’s famous (to me!) palacsinta for breakfast. Baking has long been a hobby of mine. I love making elaborately decorated treats for friends to enjoy. I bring this same sensibility to my series of Bitty Bowls and Spoons. It’s a fun way to bring color and sweetness into the kitchen (without the calories). I majored in metalsmithing in college and have been making jewelry and sculpture ever since. Making small spice bowls and spoons has been a great way for me to bridge my appreciation for well crafted food with heirloom quality objects for the talented chefs who make those amazing meals. Tough one. I’m partial to variety so I’m often trying out new restaurants when I go out. I mostly cook and eat at home but I’ve had fantastic memorable meals at several of Renee Erickson’s restaurants and would happily return to all of them repeatedly. I source the metal and glass enamel I use in my products from manufacturers within the US. Using these, I make everything by hand in my Seattle studio. I’m really excited about a new series of black and white bowls with graphite sketches I’m making. 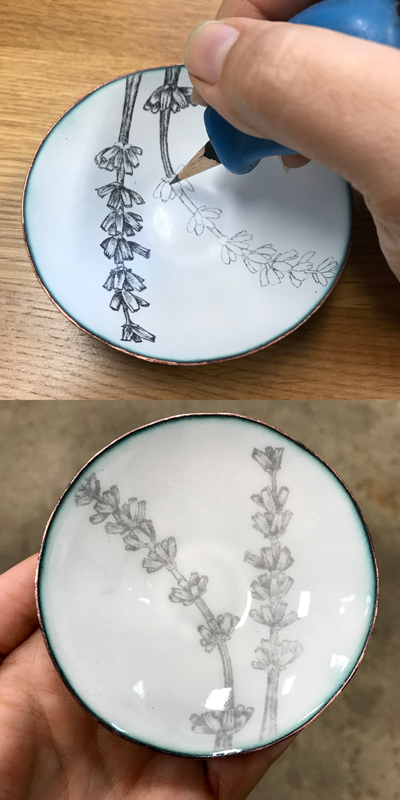 Similar to the colorful Bitty Bowls, I apply a couple base layers, but then carefully hand draw an image using a graphite pencil. This image is fused between layers of glass so it’s permanent and functional. They are also a little larger so work well with bigger hands or when you want more of your favorite spice/condiment/etc. Some of the drawings are inspired by my hikes in the area but I drew a handful of herb inspired bowls special for this show. Can you think of a better Thanksgiving host gift than this little lavender bowl?! Limited edition and one of a kind colorful bowls and spoons, copper disco spoons, the hand sketched series I mentioned above, and some special sterling silver long-handled mixing spoons for your favorite bartender. The little bowls are excellent spice prep bowls in the kitchen but also make a colorful statement on the table for salt and pepper, perfect for everyday use or when you want to pull out all the stops at your fancy dinner party. I make the bowls and spoons by forging copper into a bowl shape and then fusing it with acid resistant, lead-free glass enamel in a 1500 degree kiln. The raw spoons are forged and fabricated from metal by hand, each unique and expressive in character. 7) What are your goals for your business in the next year? First and foremost, my goal is always to make beautiful, high quality objects. I’m an artist so evolving the design and making process is the core of my business. Goals for the upcoming year include expanding one of a kind commission offerings and growing the Inspiring Women Project. 8) What was your biggest challenge when starting out? Trusting myself and my creative vision. It’s easy to have self-doubt, especially when starting out. Time and experience has led to more confidence, which makes everything easier and more fun. Speaking of starting out, since this interview is about food products, here’s a creamer and sugar bowl I made when first learning to be a metalsmith eons ago. 9) What's your favorite part of this food movement? I’m a strong proponent for quality over quantity. I appreciate locally sourced organic ingredients – makes such a big flavor difference and feels good (and fun) to support vendors at my local farmers market. I believe there is a mutual respect for the objects we have in our home and use in the kitchen – surrounding ourselves with high quality items has a similar impact to feeding ourselves with high quality healthy food, both result in a sense of considerate self-care, which makes it easier to be available and giving towards others. Speaking of local farms… Inspired by Bow Hill Blueberries, these berry bowls go great with Bow Hill’s pickled blueberries for a unique treat. 10) What's the best part of your job? I get to work with my hands and be creative on a regular basis. I also love the way it allows me to connect with people – to have my work in people’s homes where I know it’s appreciated and used. I was at a dinner party recently where salt and red pepper filled Bitty Bowls were the functional centerpiece to a warm evening of fun conversation and connection. Such an honor! This video shows me removing a batch of Bitty Bowls from the kiln after fusing the first base layer. Hands in action!